Regular cleaning products often contain harsh chemicals that could be harmful; especially to children and pets. Wanting to ensure that the surfaces in my home are not only clean but safe I decided to do some research to find out which common everyday pantry items could help me clean without the use of harsh chemicals. According to my research I discovered that cleaning with vinegar is one of the best kept cleaning secrets out there (until now that is). After using vinegar for various cleaning chores I’ve compiled what I believe are the top 5 household uses for white vinegar. 1. No wax floors. Add ½ cup of white distilled vinegar to a half gallon of warm water. Use the mop of your choice (I prefer a sponge mop with a scrubbing strip on the end) rinsing often for optimal results. 2. Window crystal clean streak free windows mix equal parts of white distilled vinegar and warm water. Dry with a soft cloth. Newspapers also make great drying cloths for windows. 3. Bathroom. Wipe down shower walls and glass doors with a sponge soaked in white distilled vinegar to remove soap scum and residue. 4. Coffee makers. Fill the water reservoir with white distilled vinegar and run through a full cycle to remove mineral deposits and residue from the coffee grounds. Refill the water reservoir with clean water and run through a full cycle to rinse. 5. Unclog shower heads and spray nozzles. Soaking a shower head or spray nozzle on the kitchen sink in white distilled vinegar overnight will remove hard water deposits and clogs maximizing the power and efficiency of the shower head and spray nozzles. Vinegar is relatively inexpensive and contains no harmful chemicals that could cause potential damage to our loved ones and pets. Happy cleaning! 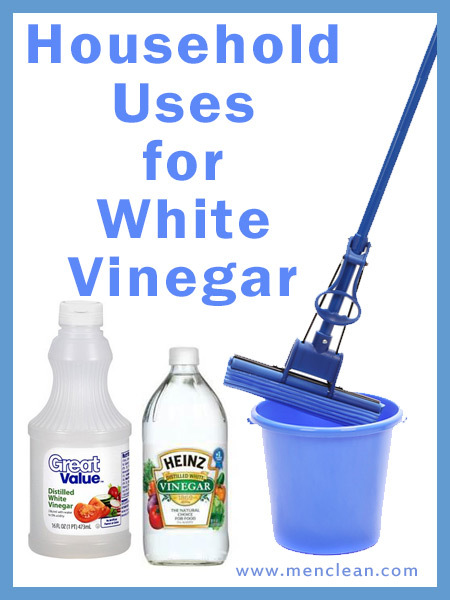 Do you know of other Household Uses for White Vinegar? Share it with us below.